Expensive in-ear headphones need to deliver performance on a par with over-ear models and be rugged enough for your commute. Sennheiser give it their all with the IE 80s but is that good enough to make it into our list of the best headphones around? The slick, sliver industrial sheen of the Sennhesier IE 80s is complemented by a matching hard case, too big for a jacket pocket but large enough to house the accessories including the mini screw driver which adjusts the bass screw on the side of each of the odd shaped earphones. The design ensures that the earphones can rest neatly in your ear at the correct angle and the cable is rugged with a sturdy connector at the end. The cable doesn't offer an inline remote, however, preferring to offer the simplest path to the earphones for audio quality. The odd shaped earphones make sense when placed in your ear - they sit backwards and rest perfectly in the outside of your lughole. Naturally, the included selection of buds mean you can find the perfect fit and the cable is long enough not to tug when attached to a smartphone in your pocket. The earphones feature protective rubber casing around the cable inputs and the earphones themselves are among the most rugged we've tested. Plug a pair into a smartphone and the connector sits at a right angle, perfect for iPhone use. The adjustable bass screws mean that it's probably a good idea to use a soft pouch when carting them around in your pocket so that they stay in place, as the hard case is closer to the size of a case to house a pair of shades rather than a pair of in-ear headphones. Still, the supplied case looks nice and if you're in possession of a smart messenger bag, it will easily slip inside. The cable is actually removable and interchangeable should you have an accident too. The bass screws and larger than standard earphones suggest that the Sennhesier IE 80s can offer more than your standard amount of in-ear bass and that theory proves completely true. Crank up the bass and hip hop and heavy rock growls with little leakage, only becoming muffled during bass heavy pop at loud volumes. You won't want to tweak the screws regularly but finding your sweet spot for bass levels based on your own music collection is a real bonus. Rivals which offer this kind of bass on tap are beyond the £269 price point and venture into pro-audio headphones produced by the likes of Shure. Once you've adjusted the bass and found your sweet spot, the Sennhesier IE 80s are well-balanced, aren't overly leaky but won't repel outside noise as much as you'd like on noisy transport. If your tastes veer towards rock and rap, there's a great depth and detail and while acoustic and classical music is handled with skill, you'll need to listen in the quietness of your home to get the best results. The £269 price tag is quite high for a pair of in-ear headphones but the sound quality of the Sennheiser IE 80s is excellent, and the comfort and durability that stand out over impressive but fragile rivals. 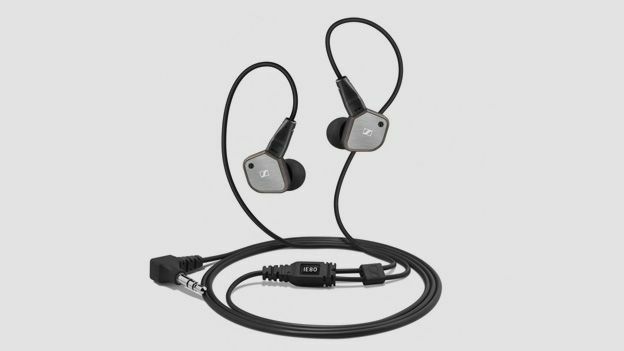 The bass tweaking option is an innovative extra that ensures you'll get the sound you demand for the cash, alongside more detail and range than you have any right to expect from in-ear headphones. We wish the heavy duty case was more practical and the price was nearer the £200 mark but, overall, that's the only criticism we can level at these impressive in-ear headphones.